This is my first Aviator Raybans and they are awesome. These sunnies just add an element of coolness to anything you have on. I love these sunnies especially for warmer months and I’m loving these from Sunglass Hut. I can see myself wearing them for a variety of summer occasions and everytime I go to the beach. These pictures are amazing! I can’t wait for summer when I see your pictures. Those sunnies are seriously cool and you are making me wish for a beach holiday! You look so relaxed and pretty! I can’t wait until I’m able to go to the beach! It just got warm here and I’m already itching to go. It’s always so relaxing and calming. Your sunglasses are the cutest, by the way! The aviators from Rayban are my ultimate favourite sunglasses. One of the obsessions I have is to buy sunglasses (seriously I have tons) but I always come back to my classic black and gold aviators. I have lost them so many times but I always invest in a new pair if I loose them. Great choice for the warmer months babe! Loving all of these photos! This look is so perfect for casual beach days. Such a completely gorgeous look ! Love the denim jacket and the Raybans. Beautiful, classic pieces styled perfectly. Cute beach look … I need holidays soon, haha. Aviators are a MUST in every girls sunglass arsenal and I love the range that Sunglass Hut offers! They’re definitely my go-to when it comes to finding new shades! Cute sunnies. I’m in need of this beautiful weather. Love your sunnies! I’m obsessed with Rayban! I just got a pair of green aviators and I love them! Also, a denim jacket has to be my favorite piece in the world! It’s so versatile and there are so many ways you can style it! Love your beach pics! So jealous! Well girl, you are rocking those sunglasses (: love every bit of your style. These Raybans are such a staple, love them! I love the denim jacket too! omg I love your gorgeous denim jacket! This entire outfit is amazing! So perfect as always! Thanks for sharing! This is a great outfit to wear to the beach! What a lovely jacket, girlie! I love the oversized fit and how it looks paired with the white! Thanks for sharing and have a great week ahead! Nice sunnies. I love Raybans! Always a good combo. Sunglass Hut usually has so much to chose from which I enjoy. I love to have meany options when it comes to getting a name brand pair of sunglasses. I am also loving the looks the sand on the beach. I need it to get hot here so I can start tanning. I’m getting very light. Very chic yet relaxed ! I love the casual beachy look, girl! And of course, the sunnies! Love your outfit, especially the color combination with your pieces! That jacket is one of the most versatile pieces that every woman should have in their wardrobe because it’s very easy to style. I love a classic denim jacket! I’ve probably wormy favorite one about three times this week! Also, ray bans are my favorite glasses! Love these! The denim jacket is an essential for any wardrobe and I love how you’ve styled yours with white pants. Perfect color combination specially for a day on the beach. Also, this glasses look amazing on you. Denim jacket is such an essential piece in every closet! It goes with everything, including the white trousers you wore. Such an effortless and chic outfit for the beach. I love Raybans, but unfortunately my face shape isn’t great wearing them, but I always love a good pair of bans on others. I literally adore denim jackets, I think this is such a statement piece so you can’t go wrong with it. I hope it will never go out of fashion. 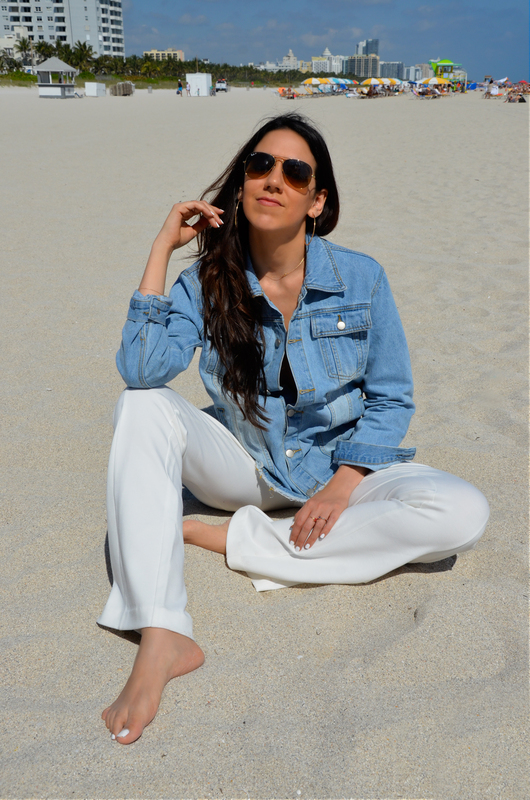 Love the combo of white pants and lighe washed denim jacket. You look gorgeous as always. Enjoy the sunshine. I love your Ray Bans. They suit you so well. And you are right- they add an element of coolness! Love the look – so relaxed and effortless! I love Raybans! 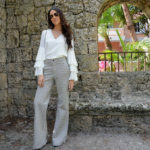 You look very Miami style! I have never been there but your photos makes me wanna go there, you’re so lucky it’s always a nice weather there. this would be a perfect outfit! Such a great casual look! I love your denim jacket and those sunnies are awesome! Love your denim jacket babe. You look so cute. Such a nice sunglasses! Lovely pics!